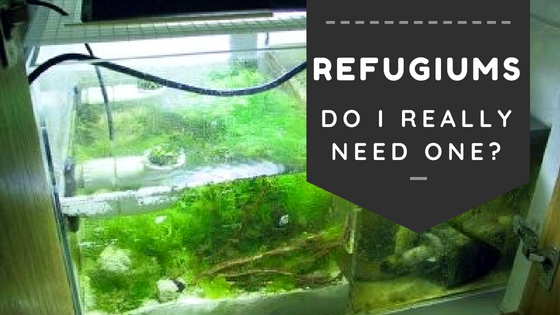 What does a refugium do and why do I need one? A refugium is a separate area of your aquarium system that offers sanctuary or refuge to creatures and plants that would not be able to thrive in your main display tank. These creatures offer tremendous benefits to your aquarium. The ocean is a vast and extremely diverse ecosystem and a refugium allows us to more closely align our tanks with what happens in nature. What benefits does a refugium offer me? 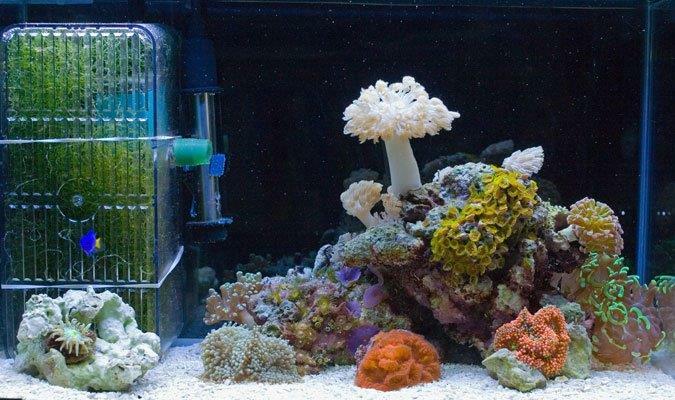 How does a refugium work? Knowing that the ocean is so vastly diverse in all its creatures, it only stands to reason that the more biodiverse we can keep our aquariums the better off they will do. A refugium allows you to do this. Many creatures such as copepods and amphipods will eat phytoplankton from your water and detritus that is settled to the bottom of your tank. They also serve as a natural food source for all of your other tank inhabitants. Because of this they are actively hunted in your display. In the refugium they have a place to thrive without being hunted. Some of these will get sucked back into the main display. Out of these some will reseed the colonies living in the rockwork of your display, others will quickly become snacks. 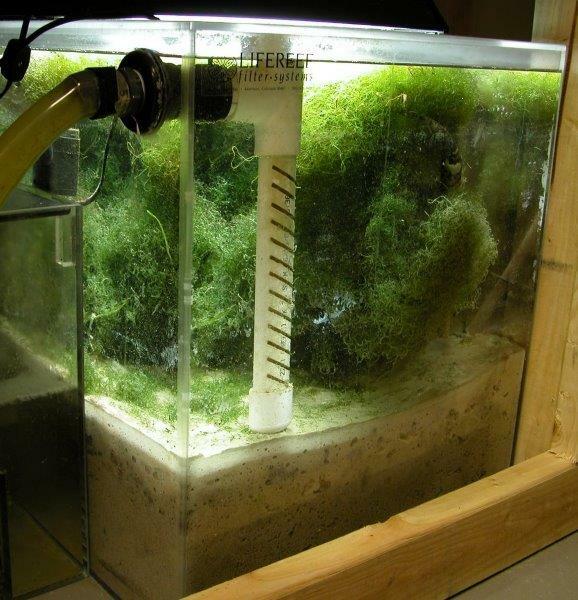 A constant battle all aquarium owners face is that of excess nutrient removal. We are continuously adding nutrients to our tank when we feed our fish. We remove some of the excess nutrients by catching excess food in filter socks and sponges as well as with our protein skimmers. But what about the nutrients that your fish eat? They don’t disappear after being eaten they simply transition to detritus that then is either eaten by other creatures or breaks up into the water. Once in the water you may remove it with water changes but much of it will ultimately feed algae. If that is an inevitable outcome, isn’t it best to pick where the algae grows? The refugium can help with this. 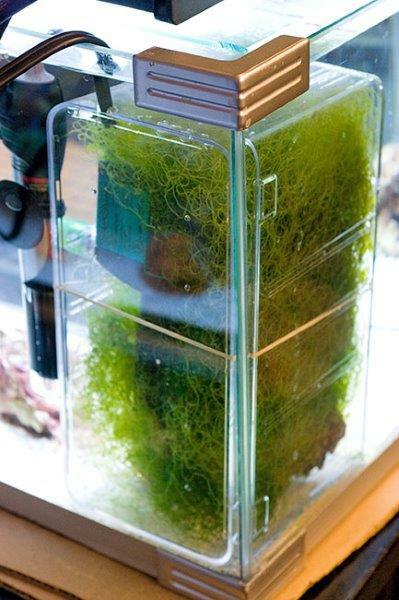 You can encourage the growth of algae in your refugium and reduce the chance it will grow in your main display. This can even help to prevent PH swings in your tank. As plants and coral photosynthesize they will lower the PH of your tank slightly. At night when they are not photosynthesizing the PH will increase slightly. Running the lights that on your refugium separately you can light your refugium while your display lights are off keeping the PH from fluctuating as much since there are always plants photosynthesizing. Another major benefit is simply that they allow your system to hold more water. The larger the water volume the less of an impact any one change will cause. If a fish were to die in a 75-gallon tank; the ammonia produced as it decade would have a larger impact than if it were in a 100-gallon system. Just by increasing the total water capacity of the system you give yourself a greater chance of success with fluctuations in water parameters. A refugium works by simply creating an area in your system that is segmented from the rest of the aquarium. It allows you to raise species that would not live long in your main tank because they would be bullied, eaten, or are just not visually wanted in your display tank. Some of these creatures include copepods, amphipods, and algae to remove excess nutrients from the tank. This can be accomplished in a couple of different ways in tank, hang on the back, or via a separate tank or sump. All three options have pros and cons. 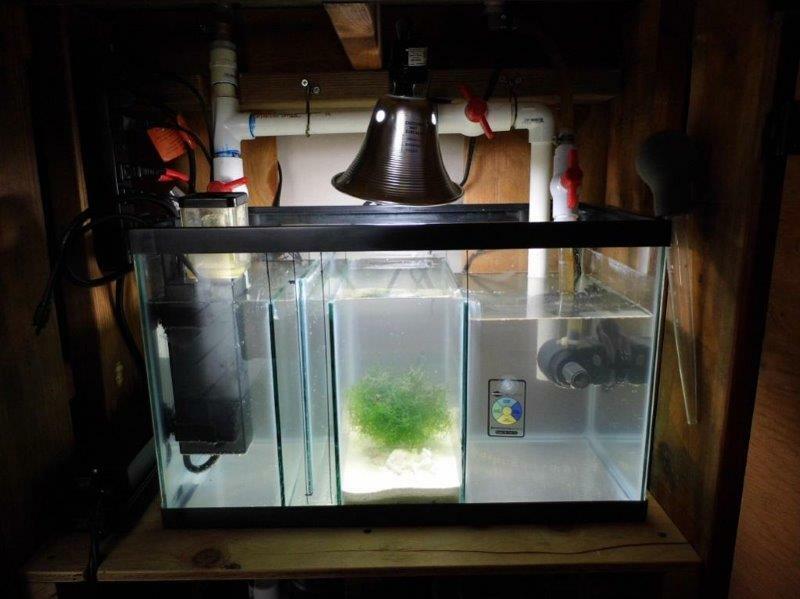 An in tank refugium is probably the cheapest way to set one up. You can either block off a portion of your main tank with a divider or container to allows water to flow through both portions but prevents creatures from passing from one section to the other. Cons – It does not add any additional water volume to the tank, it actually takes away from the space available for your primary display. 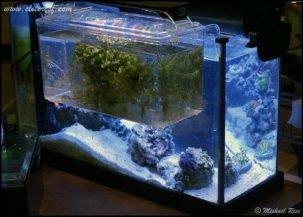 Most aquarium owners are familiar with hang on the back equipment. Your typical aquarium is sold with no holes drilled in it and all filters and equipment for these are made to hang on the top edge of the aquarium typically placed between the back of the aquarium and the wall. A hang on the back refugium is just that, it hangs on the back of the tank and water is pumped or syphoned into and out of the refugium. Pros – It does add additional water volume to the system, It is fairly inexpensive in comparison to a sump, is fairly easy to install in your system. This is my preferred method. A sump is a separate tank from the main display used to house all of the filtration equipment. It adds water capacity to the over all system and is generally hid in the stand. Within this sump you can section off a portion of it to serve as a refugium. This section should be after the water has already passed through your mechanical filtration. You can even add an additional tank to serve as a dedicated refugium. This is what I have done on my 180 gallon reef tank. Cons – is the more expensive method but expensive is always subjective, requires additional space under or beside the display. To sum it up, should you setup a refugium with your tank? Yes, if you have the space and means to do so it is highly beneficial. With so many benefits it is hard to argue with adding one to your tank. 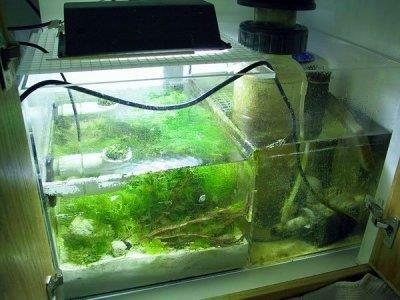 What is your experience with having or setting up a refugium? Let us know in the comments below.